At the beginning of 1944, the western half of the Winter Line was being anchored by Germans holding the Rapido-Gari, Liri and Garigliano valleys and some of the surrounding peaks and ridges. Together, these features formed the Gustav Line. Monte Cassino, a historic hilltop abbey founded in AD 529 by Benedict of Nursia, dominated the nearby town of Cassino and the entrances to the Liri and Rapido valleys. Lying in a protected historic zone, it had been left unoccupied by the Germans. They had manned some positions set into the steep slopes below the abbey's walls. Repeated pinpoint artillery attacks on Allied assault troops caused their leaders to conclude the abbey was being used by the Germans as an observation post, at the least. Fears escalated along with casualties and in spite of a lack of clear evidence, it was marked for destruction. On 15 February American bombers dropped 1,400 tons of high explosives, creating widespread damage. The raid failed to achieve its objective, as German paratroopers occupied the rubble and established excellent defensive positions amid the ruins. 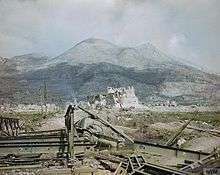 Between 17 January and 18 May, Monte Cassino and the Gustav defences were assaulted four times by Allied troops, the last involving twenty divisions attacking along a twenty-mile front. The German defenders were finally driven from their positions, but at a high cost. 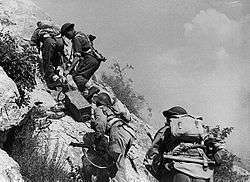 The capture of Monte Cassino resulted in 55,000 Allied casualties, with German losses being far fewer, estimated at around 20,000 killed and wounded. The Allied landings in Italy in September 1943 by two Allied armies commanded by General Sir Harold Alexander, Commander-in-Chief of the Allied Armies in Italy, were followed by an advance northward on two fronts, one on each side of the central mountain range forming the "spine" of Italy. On the western front, U.S. Fifth Army, commanded by Lieutenant General Mark W. Clark, moved from the main base of Naples up the Italian "boot" and in the east General Sir Bernard Montgomery's British Eighth Army advanced up the Adriatic coast. Fifth Army made slow progress in the face of difficult terrain, wet weather and skillful German defences. The Germans were fighting from a series of prepared positions in a manner designed to inflict maximum damage, then pulling back while buying time for the construction of the Winter Line defensive positions south of Rome. The original estimates that Rome would fall by October 1943 proved far too optimistic. Although in the east the German defensive line had been breached on the Eighth Army's Adriatic front and Ortona was captured, the advance had ground to a halt with the onset of winter blizzards at the end of December, making close air support and movement in the jagged terrain impossible. The route to Rome from the east using Route 5 was thus excluded as a viable option leaving the routes from Naples to Rome, highways 6 and 7, as the only possibilities; Highway 7 (the old Roman Appian Way) followed along the west coast but south of Rome ran into the Pontine Marshes, which the Germans had flooded. With its heavily fortified mountain defences, difficult river crossings and valley head flooded by the Germans, Cassino formed a linchpin of the Gustav Line, the most formidable line of the defensive positions making up the Winter Line. In spite of its potential excellence as an observation post, because of the fourteen century old Benedictine abbey's historical significance, the German commander-in-chief in Italy, Field Marshal Albert Kesselring, ordered German units not to include it in their defensive positions and informed the Vatican and the Allies accordingly in December 1943. The plan of the U.S. Fifth Army commander, Lieutenant General Mark W. Clark, was for British X Corps, on the left of a thirty-kilometer (20 mi) front, to attack on 17 January 1944, across the Garigliano near the coast (British 5th and British 56th). British 46th Infantry Division was to attack on the night of 19 January across the Garigliano below its junction with the Liri in support of the main attack by U.S. II Corps on their right. The main central thrust by U.S. II Corps would commence on 20 January with U.S. 36th (Texas) Infantry Division making an assault across the swollen Gari river five miles (8 km) downstream of Cassino. Simultaneously the French Expeditionary Corps, under General Alphonse Juin would continue its "right hook" move towards Monte Cairo, the hinge to the Gustav and Hitler defensive lines. In truth, Clark did not believe there was much chance of an early breakthrough, but he felt that the attacks would draw German reserves away from the Rome area in time for the attack on Anzio where U.S. VI Corps (British 1st Infantry Division and U.S. 3rd Infantry Division) was due to make an amphibious landing on 22 January. It was hoped that the Anzio landing, with the benefit of surprise and a rapid move inland to the Alban Hills, which command both routes 6 and 7, would so threaten the Gustav defenders' rear and supply lines that it might just unsettle the German commanders and cause them to withdraw from the Gustav Line to positions north of Rome. Whilst this would have been consistent with the German tactics of the previous three months, Allied intelligence had not understood that the strategy of fighting retreat had been for the sole purpose of providing time to prepare the Gustav line where the Germans intended to stand firm. The intelligence assessment of Allied prospects was therefore over-optimistic. The Fifth Army had only reached the Gustav Line on 15 January, having taken six weeks of heavy fighting to advance the last seven miles (11 km) through the Bernhardt Line positions during which time they had sustained 16,000 casualties. They hardly had time to prepare the new assault, let alone take the rest and reorganization they really needed after three months of attritional fighting north from Naples. However, because the Allied Chiefs of Staff would only make landing craft available until early February, the Anzio landing had to take place in late January with the coordinated attack on the Gustav line some three days earlier. 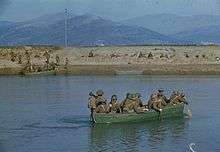 Royal Engineers of the British 46th Infantry Division cross the Garigliano river, 19 January 1944. 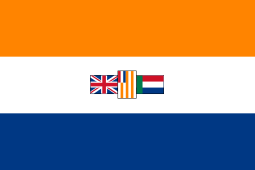 The first assault was made on 17 January. Near the coast, British X Corps (56th and 5th Divisions) forced a crossing of the Garigliano (followed some two days later by British 46th Division on their right) causing General von Senger, commander of German XIV Panzer Corps and responsible for the Gustav defences on the south western half of the line, some serious concern as to the ability of the German 94th Infantry Division to hold the line. Responding to Senger's concerns, Kesselring ordered the 29th and 90th Panzer Grenadier Divisions from the Rome area to provide reinforcement. There is some speculation as to what might have been if X Corps had had the reserves available to exploit their success and make a decisive breakthrough. The corps did not have the extra men, but there would certainly have been time to alter the overall battle plan and cancel or modify the central attack by U.S. II Corps to make men available to force the issue in the south before the German reinforcements were able to get into position. As it happened, Fifth Army HQ failed to appreciate the frailty of the German position and the plan was unchanged. The two divisions from Rome arrived by 21 January and stabilized the German position in the south. In one respect, however, the plan was working in that Kesselring's reserves had been drawn south. The three divisions of X Corps sustained 4,000 casualties during the period of the first battle. The assault had been a costly failure, with 36th Division losing 2,100 men killed, wounded and missing in 48 hours. As a result, the army's conduct of this battle became the subject of a Congressional inquiry after the war. On the right, the Moroccan-French troops made good initial progress against the German 5th Mountain Division, commanded by General Julius Ringel, gaining positions on the slopes of their key objective, Monte Cifalco. Forward units of the 3rd Algerian Division had also by-passed Monte Cifalco to capture Monte Belvedere and Colle Abate. General Juin was convinced that Cassino could be bypassed and the German defences unhinged by this northerly route but his request for reserves to maintain the momentum of his advance was refused and the one available reserve regiment (from 36th Division) was sent to reinforce 34th Division. By 31 January the French had ground to a halt with Monte Cifalco, which had a clear view of the French and U.S. flanks and supply lines, still in German hands. The two Moroccan-French divisions sustained 2,500 casualties in their struggles around Monte Belvedere. It became U.S. 34th Division's task (joined by 142nd Regiment of 36th Division) to fight southward along the linked hilltops towards the intersecting ridge on the south end of which was Monastery Hill. They could then break through down into the Liri valley behind the Gustav Line defences. It was very tough going: the mountains were rocky, strewn with boulders and cut by ravines and gullies. Digging foxholes on the rocky ground was out of the question and each feature was exposed to fire from surrounding high points. The ravines were no better since the gorse growing there, far from giving cover, had been sown with mines, booby-traps and hidden barbed wire by the defenders. The Germans had had three months to prepare their defensive positions using dynamite and to stockpile ammunition and stores. There was no natural shelter and the weather was wet and freezing cold. By early February, American infantry had captured a strategic point near the hamlet of San Onofrio, less than a mile from the abbey and by 7 February a battalion had reached Point 445, a round top hill immediately below the monastery and no more than 400 yards (370 m) away. An American squad managed a reconnaissance right up against the cliff-like abbey walls, with the monks observing German and American patrols exchanging fire. 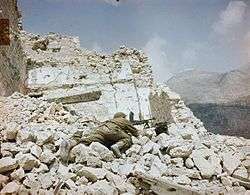 However, attempts to take Monte Cassino were broken by overwhelming machine gun fire from the slopes below the monastery. Despite their fierce fighting, the 34th Division never managed to take the final redoubts on Hill 593 (known to the Germans as Calvary Mount), held by the 3rd Battalion of the German 2nd Parachute Regiment, the dominating point of the ridge to the monastery. On 11 February, after a final unsuccessful 3-day assault on Monastery Hill and Cassino town, the Americans were withdrawn. U.S. II Corps, after two and a half weeks of torrid battle, was fought out. The performance of 34th Division in the mountains is considered to rank as one of the finest feats of arms carried out by any soldiers during the war. In return they sustained losses of about 80 per cent in the Infantry battalions, some 2,200 casualties. At the height of the battle in the first days of February General von Senger und Etterlin had moved 90th Division from the Garigliano front to north of Cassino and had been so alarmed at the rate of attrition, he had "...mustered all the weight of my authority to request that the Battle of Cassino should be broken off and that we should occupy a quite new line. ... a position, in fact, north of the Anzio bridgehead". Kesselring refused the request. At the crucial moment von Senger was able to throw in the 71st Infantry Division whilst leaving 15th Panzer Grenadiers (whom they had been due to relieve) in place. During the battle there had been occasions when, with more astute use of reserves, promising positions might have been turned into decisive moves. Some historians suggest this failure to capitalize on initial success could be put down to Clark's lack of experience. However, it is more likely that he just had too much to do, being responsible for both the Cassino and Anzio offensives. This view is supported by the inability of Major General Lucian Truscott, the U.S. 3rd Division commander, as related below, to get hold of him for discussions at a vital juncture of the Anzio breakout at the time of the fourth Cassino battle. Whilst General Sir Harold Alexander, commanding the Allied Armies in Italy, chose (for perfectly logical co-ordination arguments) to have Cassino and Anzio under a single army commander and splitting the Gustav Line front between U.S. Fifth Army and British Eighth Army, Kesselring chose to create a separate Fourteenth Army under General Eberhard von Mackensen to fight at Anzio whilst leaving the Gustav line in the sole hands of General Heinrich von Vietinghoff's Tenth Army. The withdrawn American units were replaced by the New Zealand Corps (2nd New Zealand Division and 4th Indian Division) from the Eighth Army on the Adriatic front. The New Zealand Corps was commanded by Lieutenant-General Bernard C. Freyberg. The British press and C. L. Sulzberger of The New York Times frequently and convincingly and in (often manufactured) detail wrote of German observation posts and artillery positions inside the abbey. The commander in chief of the Mediterranean Allied Air Forces Lieutenant General Ira C. Eaker accompanied by Lieutenant General Jacob L. Devers (deputy to General Sir Henry Maitland Wilson, the Supreme Allied Commander of the Mediterranean Theater) personally observed during a fly-over "a radio mast [...] German uniforms hanging on a clothesline in the abbey courtyard; [and] machine gun emplacements 50 yards (46 m) from the abbey walls. "[nb 1] Countering this, Major General Geoffrey Keyes of U.S. II Corps also flew over the monastery several times, reporting to Fifth Army G-2 he had seen no evidence the Germans were in the abbey. When informed of others' claims of having seen enemy troops there, he stated: "They’ve been looking so long they’re seeing things." On 11 February 1944, the acting commander of 4th Indian Division, Brigadier Harry Dimoline, requested a bombing raid. Tuker reiterated again his case from a hospital bed in Caserta, where he was suffering a severe attack of a recurrent tropical fever. Freyberg transmitted his request on 12 February. The request, however, was greatly expanded by air force planners and probably supported by Ira Eaker and Jacob Devers, who sought to use the opportunity to showcase the abilities of U.S. Army air power to support ground operations. Lieutenant General Mark W. Clark of Fifth Army and his chief of staff Major General Alfred Gruenther remained unconvinced of the "military necessity". When handing over the U.S. II Corps position to the New Zealand Corps, Brigadier General J.A. Butler, deputy commander of U.S. 34th Division, had said "I don't know, but I don't believe the enemy is in the convent. All the fire has been from the slopes of the hill below the wall". Finally Clark, "who did not want the monastery bombed," pinned down the Commander-in-Chief Allied Armies in Italy, General Sir Harold Alexander to take the responsibility: "I said, 'You give me a direct order and we’ll do it,' and he did." The bombing mission in the morning of 15 February 1944 involved 142 Boeing B-17 Flying Fortress heavy bombers followed by 47 North American B-25 Mitchell and 40 Martin B-26 Marauder medium bombers. In all they dropped 1,150 tons of high explosives and incendiary bombs on the abbey, reducing the entire top of Monte Cassino to a smoking mass of rubble. Between bomb runs, the II Corps artillery pounded the mountain. Many Allied soldiers and war correspondents cheered as they observed the spectacle. Eaker and Devers watched; Juin was heard to remark "... no, they’ll never get anywhere this way." Clark and Gruenther refused to be on the scene and stayed at their headquarters. That same afternoon and the next day an aggressive follow-up of artillery and a raid by 59 fighter bombers wreaked further destruction. The German positions on Point 593 above and behind the monastery were untouched. It is certain from every investigation that followed since the event that the only people killed in the monastery by the bombing were 230 Italian civilians seeking refuge in the abbey. There is no evidence that the bombs dropped on the Monte Cassino monastery that day ever killed any German troops. However, given the imprecision of bombing in those days (it was estimated that only 10 per cent of the bombs from the heavy bombers, bombing from high altitude, hit the monastery) bombs did fall elsewhere and killed German and Allied troops alike, although that would have been unintended. 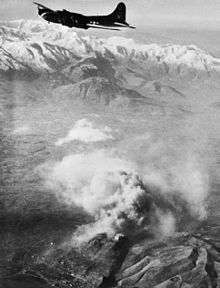 Indeed, sixteen bombs hit the Fifth Army compound at Presenzano 17 miles (27 km) from Monte Cassino and exploded only yards away from the trailer where Gen. Clark was doing paperwork at his desk. In the other half of the main assault the two companies from 28th (Māori) Battalion from the New Zealand Division forced a crossing of the Rapido and attempted to gain the rail road station in Cassino town. The intention was to take a perimeter that would allow engineers to build a causeway for armoured support. With the aid of a near constant smoke screen laid down by Allied artillery that obscured their location to the German batteries on Monastery Hill, the Māori were able to hold their positions for much of the day. 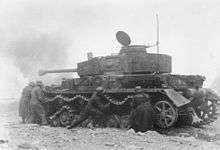 Their isolation and lack of both armoured support and anti-tank guns made for a hopeless situation, however, when an armoured counter-attack came in the afternoon on 18 February. They were ordered to pull back to the river when it became clear to headquarters that both the attempts to break through (in the mountains and along the causeway) would not succeed. It had been very close. The Germans had been very alarmed by the capture of the station and from a conversation on record between Kesselring and Tenth Army commander Gen. von Vietinghoff, had not expected their counter-attack to succeed. For the third battle, it was decided that whilst the winter weather persisted, fording the Gari downstream of Cassino town was an unattractive option (after the unhappy experiences in the first two battles). The "right hook" in the mountains had also been a costly failure and it was decided to launch twin attacks from the north along the Rapido valley: one towards the fortified Cassino town and the other towards Monastery Hill. The idea was to clear the path through the bottleneck between these two features to allow access towards the station on the south and so to the Liri valley. British 78th Infantry Division, which had arrived in late February and placed under the command of New Zealand Corps, would then cross the Rapido downstream of Cassino and start the push to Rome. 19 March was planned for the decisive blow in the town and on the monastery, including a surprise attack by tanks of 20th Armoured Regiment working their way along the track ("Cavendish Road") from Caira to Albaneta Farm (which had been prepared by engineer units under the cover of darkness) and from there towards the abbey. However, a surprise and fiercely pressed counter-attack from the monastery on Castle Hill by the German 1st Parachute Division completely disrupted any possibility of an assault on the monastery from the Castle and Hangman's Hill whilst the tanks, lacking infantry support, were all knocked out by mid-afternoon. In the town the attackers made little progress and overall the initiative was passing to the Germans whose positions close to Castle Hill, which was the gateway to the position on Monastery Hill, crippled any prospects of early success. Fourth Battle (Operation Diadem): Allied Plan of Attack. ...to force the enemy to commit the maximum number of divisions in Italy at the time the cross-channel invasion is launched. Circumstances allowed him the time to prepare a major offensive to achieve this. 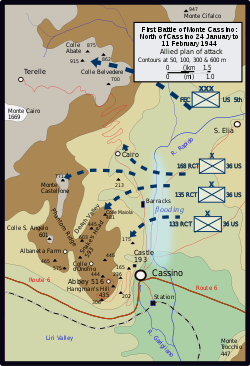 His plan, originally inspired from French General Alphonse Juin's idea to circle around Cassino and take the Aurunci with his mountain troops to break the Gustav Line, was to shift the bulk of the British Eighth Army, commanded by Lieutenant-General Sir Oliver Leese, from the Adriatic front across the spine of Italy to join Lieutenant General Mark Clark's U.S. Fifth Army and attack along a 20-mile (32 km) front between Cassino and the sea. Fifth Army (U.S. II Corps and French Expeditionary Corps) would be on the left and Eighth Army (British XIII Corps and Polish II Corps) on the right. With the arrival of the spring weather, ground conditions were improved and it would be possible to deploy large formations and armour effectively. 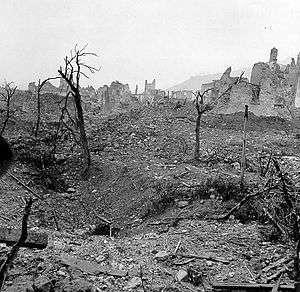 The first assault (11–12 May) on Cassino opened at 23:00 with a massive artillery bombardment with 1,060 guns on the Eighth Army front and 600 guns on the Fifth Army front, manned by British, Americans, Poles, New Zealanders, South Africans and French. Within an hour and a half the attack was in motion in all four sectors. By daylight the U.S. II Corps had made little progress, but their Fifth Army colleagues, the French Expeditionary Corps, had achieved their objectives and were fanning out in the Aurunci Mountains toward the Eighth Army to their right, rolling up the German positions between the two armies. On the Eighth Army front, British XIII Corps had made two strongly opposed crossings of the Gari (by British 4th Infantry Division and 8th Indian Division). Crucially, the engineers of Dudley Russell's 8th Indian Division had by the morning succeeded in bridging the river enabling the armour of 1st Canadian Armoured Brigade to cross and provide the vital element (so missed by the Americans in the first battle and New Zealanders in the second battle) to beat off the inevitable counter-attacks from German tanks that would come. In 1943, the Goumiers were colonial troops formed into four Groups of Moroccan Tabors (GTM), each consisting of three loosely organised Tabors (roughly equivalent to a battalion) specialised in mountain warfare. Juin's French Expeditionary Corps consisted of the Command of Moroccan Goumiers (CGM) (with the 1st, 3rd and 4th GTM) of General Augustin Guillaume totalling some 7,800 fighting men, broadly the same infantry strength as a division and 4 more conventional divisions: the 2nd Moroccan Infantry Division (2 DIM), the 3rd Algerian Infantry Division (3 DIA), the 4th Moroccan Mountain Division (4 DMM) and the 1st Free French Division (1 DM). In spite of the stiffening enemy resistance, the 2nd Moroccan Division penetrated the Gustave [sic] Line in less than two day’s fighting. The next 48 hours on the French front were decisive. The knife-wielding Goumiers swarmed over the hills, particularly at night and General Juin’s entire force showed an aggressiveness hour after hour that the Germans could not withstand. Cerasola, San Giorgio, Mt. D’Oro, Ausonia and Esperia were seized in one of the most brilliant and daring advances of the war in Italy... For this performance, which was to be a key to the success of the entire drive on Rome, I shall always be a grateful admirer of General Juin and his magnificent FEC. On 17 May, Polish II Corps launched their second attack on Monte Cassino. Under constant artillery and mortar fire from the strongly fortified German positions and with little natural cover for protection, the fighting was fierce and at times hand-to-hand. With their line of supply threatened by the Allied advance in the Liri valley, the Germans decided to withdraw from the Cassino heights to the new defensive positions on the Hitler Line. 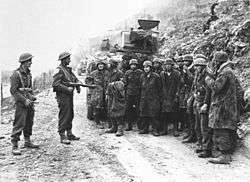 In the early hours of 18 May the British 78th Division and Polish II Corps linked up in the Liri valley 2 miles (3.2 km) west of Cassino town. On the Cassino high ground the survivors of the second Polish offensive were so battered that "it took some time to find men with enough strength to climb the few hundred yards to the summit." A patrol of Polish 12th Podolian Polish cavalry Regiment finally made it to the heights and raised a Polish flag over the ruins. The only remnants of the defenders were a group of thirty German wounded who had been unable to move. "The Poles, on their second try, had taken Monte Cassino and the road to Rome was open." At the end of the war the Poles erected a Polish Cemetery at Monte Cassino on the slope of the mountain. A knocked out Sherman tank by a Bailey bridge in the foreground with Monastery Ridge and Castle Hill in the background shortly after capture. As the Canadians and Poles launched their attack on 23 May, Major General Lucian Truscott, who had replaced John Lucas as commander of U.S. VI Corps, launched a two pronged attack using five (three U.S. and two British) of the seven divisions in the beachhead at Anzio. The German 14th Army, facing this thrust, was without any armoured divisions because Kesselring had sent his armour south to assist 10th Army in the Cassino action. A single armoured division, the 26th Panzer, was in transit from north of Rome where it had been held anticipating the non-existent seaborne landing the Allies had faked and so was unavailable to fight. By 25 May, with the German 10th Army in full retreat, Truscott's VI Corps were, as planned, driving eastwards to cut them off. By the next day they would have been astride the line of retreat and 10th Army, with all Kesselring's reserves committed to them, would have been trapped. At this point, astonishingly, Lieutenant General Clark, commanding general of the Fifth Army, ordered Truscott to change his line of attack from a northeasterly one to Valmontone on Route 6 to a northwesterly one directly towards Rome. Reasons for Clark's decision are unclear and controversy surrounds the issue. Most commentators point to Clark's ambition to be the first to arrive in Rome although some suggest he was concerned to give a necessary respite to his tired troops (notwithstanding the new direction of attack required his troops to make a frontal attack on the Germans' prepared defences on the Caesar C line). Truscott later wrote in his memoirs that Clark "was fearful that the British were laying devious plans to be first into Rome," a sentiment somewhat reinforced in Clark's own writings. However, General Alexander had clearly laid down the Army boundaries before the battle and Rome was allocated to Fifth Army. Eighth Army was constantly reminded that their job was to engage 10th Army, destroy as much of it as possible and then bypass Rome to continue the pursuit northwards (which in fact they did, harrying the retreating 10th Army for some 225 miles (362 km) towards Perugia in 6 weeks). An opportunity was indeed missed and seven divisions of 10th Army were able to make their way to the next line of defence, the Trasimene Line where they were able to link up with Fourteenth Army and then make a fighting withdrawal to the formidable Gothic Line north of Florence. Battle honours were awarded to some units for their roles at Cassino. Some units which participated in the first part of the campaign were awarded the battle honour 'Cassino I'. In addition, subsidiary battle honours were given to some units which participated in specific engagements during the first part. These were Monastery Hill, Castle Hill and Hangman's Hill. Unloading of Monte Cassino property in the Piazza Venezia in Rome. 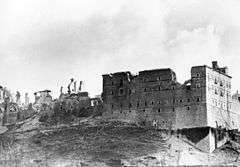 During prior months in the Italian autumn of 1943, two officers in the Hermann Göring Panzer Division, Captain Maximilian Becker and Lieutenant Colonel Julius Schlegel, proposed the removal of Monte Cassino's treasures to the Vatican and Vatican-owned Castel Sant'Angelo ahead of the approaching front. The officers convinced church authorities and their own senior commanders to use the division’s trucks and fuel for the undertaking. They had to find the materials necessary for crates and boxes, find carpenters among their troops, recruit local labourers (to be paid with rations of food plus twenty cigarettes a day) and then manage the "massive job of evacuation centered on the library and archive," a treasure "literally without price." The richness of the abbey’s archives, library and gallery included "800 papal documents, 20,500 volumes in the Old Library, 60,000 in the New Library, 500 incunabula, 200 manuscripts on parchment, 100,000 prints and separate collections." The first trucks, carrying paintings by Italian old masters, were ready to go less than a week from the day Becker and Schlegel independently first came to Monte Cassino. Each vehicle carried monks to Rome as escorts; in more than 100 truckloads the convoys saved the abbey’s monastic community. The task was completed in the first days of November 1943. "In three weeks, in the middle of a losing war, in another country, it was quite a feat." After a mass in the basilica, Abbot Gregorio Diamare formally presented signed parchment scrolls in Latin to General Paul Conrath, to tribuno militum Julio Schlegel and Maximiliano Becker medecinae doctori "for rescuing the monks and treasures of the Abbey of Monte Cassino." After the war Schlegel spent seven months in an Allied prison as a suspected looter but was freed after favourable testimony from the Monte Cassino monks. Among the treasures saved were Titians, an El Greco and two Goyas. Among the huge variety of troops serving at Monte Cassino, probably the most unusual was a bear from Iran, called Wojtek. Raised by and enlisted into the 22nd Artillery Supply Company of the Polish II Corps, he carried artillery shells during the battle. The day following the battle, the Goumiers, French Moroccan colonial troops attached to the French Expeditionary Forces, raped and murdered through the surrounding hills, plundering the countryside. Some of these irregular units committed atrocities against the Italian peasant communities in the region. In Italy the victims of these acts were described as Marocchinate meaning literally "Moroccaned" (or people who have been subjected to acts committed by Moroccans). However, other sources including the French Marshal Jean de Lattre de Tassigny declared such cases to be isolated events that were used by German propaganda to smear the Allies, and French troops in particular. 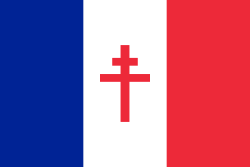 Immediately after the cessation of fighting at Monte Cassino, the Polish government in Exile (in London) created the Monte Cassino campaign cross to commemorate the Polish part in the capture of the strategic point. It was also during this time that Polish song-writer Feliks Konarski, who had taken part in the fighting there, wrote his anthem "Czerwone maki na Monte Cassino" ("The Red Poppies on Monte Cassino"). Later, an imposing Polish cemetery was laid out; this is prominently visible to anybody surveying the area from the restored monastery. ↑ There is an inconsistency between the description of this event by historian Albert Simpson in the Official History of the Army Air Force published in 1951 and that described in Hapgood & Richardson (based on a taped interview with Eaker by co-author D. W. Richardson). The Official History says the flight took place in a Piper Cub at a height of "less than 200 feet" while the later publication states the flight took place in an L-5 Sentinel at an altitude of between 1,200 and 1,500 feet and that the generals’ flight was escorted by three fighter-bombers flying 1,000 feet (300 m) above them. The confusion between the J-3 and L-5 is easy to understand since they are very similar aircraft. It is possible that the difference in height is explained by the one being a height above the abbey and the other a height above the valley floor. ↑ The Germans concluded an agreement with the Vatican in December 1943 giving assurance that German troops would not occupy the abbey. The British official history, first published in 1973, states that the German commanders considered the "Cassino Position" to be the keystone of the defensive line but concludes that "There is abundant and convincing evidence that the Germans made no military use whatever of the abbey's buildings until after the Allies had wrecked them by bombing." ↑ It would not be the first time the abbey had been demolished over the centuries: between 577 and 589 Monte Cassino was destroyed by the Lombards; by the Saracens in 883; and by an earthquake in 1349. ↑ Crwys-Williams, Jennifer (1992). A country at war, 1939–1945: the mood of a nation. Ashanti Publications. p. 358. ISBN 978-1-874800-49-1. ↑ Villoresi, Luca. "Barbarigo Teschi e memorie". La Repubblica, Culture section (in Italian) (3 June 1994): 35. Retrieved 24 April 2009. 1 2 3 4 Axelrod, Alan (2008). Real History Of World War II: A New Look at the Past. New York: Sterling Publishing Co Inc. p. 208. ISBN 978-1-4027-4090-9. ↑ Manchester, William; Paul Reid (2012). The Last Lion, Winston Spencer Churchill: Defender of the Realm 1940–1965 (1st ed.). Boston: Little, Brown. p. 801. ISBN 0316547700. ↑ Jordan, D, (2004), Atlas of World War II. Barnes & Noble Books, p. 92. ↑ 1944: la battaglia di S.Angelo in Theodice e la confusione tra i fiumi Rapido e Gari, 1944: the Battle of St. Angelo in Theodice and the Confusion between Rapido and Gari rivers. ↑ E.D. Smith, p. 26. ↑ Atkinson 2007, pp. 344–354. ↑ E.D. Smith, pp. 63–64 & 68. 1 2 Majdalany, p. 91. 1 2 Hapgood & Richardson, p. 185. 1 2 Laurie, p. 15. ↑ Molony, Vol. V, p. 802. 1 2 Thomas, Steven (7 June 2003). "The French Expeditionary Corps in Italy: Order of battle". Steven's Balagan website. Archived from the original on 26 January 2012. Retrieved 21 February 2012. 1 2 3 Molony, Vol. VI, p. 133. 1 2 Majdalany, p. 256. ↑ Garvey, John (1996-04-05). "A Canticle for Leibowitz: A Eulogy for Walt Miller". Commonweal. Commonweal Foundation. 123 (7): 7–8. I went to war with very romantic ideas about war, and I came back sick. ↑ Roberson, Williams H.; Battenfeld, Robert L. (1992-06-30). Walter M. Miller, Jr.: A Bio-Bibliography. Bio-Bibliographies in American Literature. Westport, CT: Greenwood Press. ISBN 978-0-313-27651-4. ↑ Duncan, George. "Italy: Rampage on Monte Cassino". George Duncan's Massacres and Atrocities of World War II. Retrieved 21 February 2012. ↑ Schrijvers, Peter (15 Mar 2012). The Margraten Boys: How a European Village Kept America's Liberators Alive. Palgrave Macmillan. pp. 99–100. ISBN 9780230346635. ↑ McMahon, Barbara (5 June 2006). "Memorial unveiled in honour of allies who liberated Rome". The Guardian. Retrieved 21 February 2012. Molony, Brigadier C.J.C. ; with Flynn, Captain F.C. (R.N. ); Davies, Major-General H.L. & Gleave, Group Captain T.P. (2004) [1st. pub. HMSO:1973]. Butler, Sir James, ed. The Mediterranean and Middle East, Volume V: The Campaign in Sicily 1943 and The Campaign in Italy 3rd September 1943 to 31st March 1944. History of the Second World War, United Kingdom Military Series. Uckfield, UK: Naval & Military Press. ISBN 1-84574-069-6. Molony, Brigadier C.J.C. ; with Flynn, Captain F.C. (R.N. ); Davies, Major-General H.L. & Gleave, Group Captain T.P. (2004) [1st. pub. HMSO:1984]. Butler, Sir James, ed. The Mediterranean and Middle East, Volume VI: Victory in the Mediterranean, Part 1 – 1st April to 4th June 1944. History of the Second World War, United Kingdom Military Series. Revised by Jackson, General Sir William. Uckfield, UK: Naval & Military Press. ISBN 1-84574-070-X. Phillips, N.C. (1957). Italy Volume I: The Sangro to Cassino. 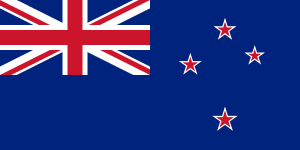 Official History of New Zealand in the Second World War 1939–45. Wellington, New Zealand: War History Branch, Department Of Internal Affairs. Archived from the original on 17 November 2007. Retrieved 2007-11-28. Simpson, Albert F. (1983) . "Chapter 10. Anzio". In Craven, Wesley Frank; Cate, James Lea. Volume Three. Europe: Argument to V-E Day, January 1944 to May 1945. 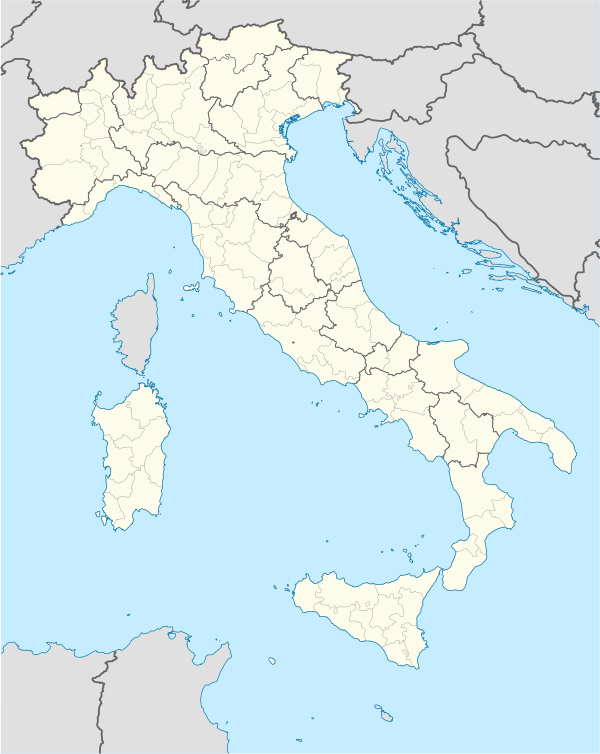 Section III – Italy. The Army Air Forces in World War II. University of Chicago Press on behalf of the Office of Airforce History. ISBN 978-0-912799-03-2. OCLC 314452493.